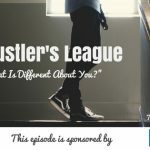 TSE 849: Sales From The Street:"We Had To Be Different"
Jaron Rice found himself facing a challenge that he didn’t create. His industry had a horrible reputation for being less-than-transparent, and even deceptive. In order to succeed, his struggle was two-fold: he had to find new prospects, and he had to be different. 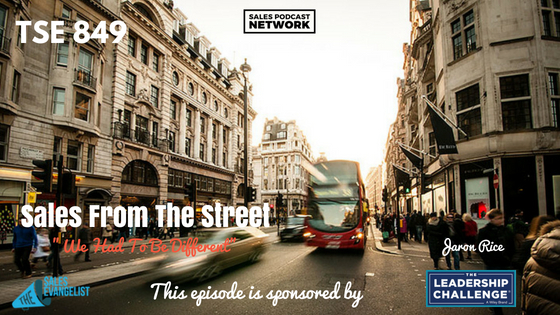 On today’s episode of Sales From The Street, Jaron explains how he worked beyond the negative stigma and grew his business to be the highest-rated merchant services provider in Maryland. In its fourth year, Magothy Payments helps businesses become more profitable by lowering the cost of credit card acceptance. Jaron had to build a brand that was different than the traditional banks people were accustomed to dealing with. Jaron called his introduction into the industry a sobering reality because so many doors were slammed in his face. In order to understand the stigma, he started by surveying previous clients that he knew from other industries he had worked in. He asked them about their payment processors; specifically about the things they liked as well as the things they didn’t. He never asked them to do business with him. He simply asked for their feedback. What he discovered was that they all hated his industry, but they liked him, and they said they would be willing to do business with him. He reached out first to business owners who knew him; local businesses that were familiar with his face because he spent money with them. Once he brought them on as clients, he was determined to continue providing value. The payment processing industry is marked by attrition. Businesses generally change credit card processors every 10 months, averaging out to 22 percent attrition each year. Over the course of five years, businesses turn over their entire client base. As a result, they strive to make as much money as possible within that period of time. Jaron’s company turned that model on its head, deciding instead to make less money knowing that they would keep client accounts much longer. In the company’s first four years, its attrition is less than three percent. Although they aren’t making as much money in a short period of time, they’re making more money in the long run. Additionally, their existing clients are bringing them new business. Jaron’s company absorbed all the risk in order to attract new clients and overcome the industry’s negative reputation. Rather than requiring contracts, Magothy allowed month-to-month transactions with no termination fees. That made it vital for the company to make sure it was providing value to its customers. At the end of each client’s first full billing cycle, the company conducted an analysis to compare the initial proposal with the client’s actual results. Once the company demonstrates its ability to do what it promised, Jaron asks his clients for online reviews and referrals. In less than four years, the company has accumulated 225 accounts, most of which exist within a 10-mile radius of Jaron’s office. The company welcomes 8-12 new clients each month purely from referrals and networking. The company’s reputation of trustworthiness and value has turned clients into evangelists. Next, Jaron is seeking to build more partnerships like the one he enjoys with the Better Business Bureau because those relationships yield lots of new accounts. 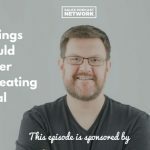 He emphasizes the importance of knowing your own value, especially for small businesses whose temptation is to simply undercut the competition. Don’t be afraid to walk away from a deal that isn’t making you any money. Connect with Jaron on LinkedIn or at his website, www.magothy.biz.If you’re in the Maryland area, contact Magothy Payments to learn more about the state’s highest-rated merchant services provider. Jaron’s story provides that we can all strive to be better and overcome challenges we’re facing. We have to apply what we learn though. Our Facebook group The Sales Evangelizers brings together sellers of all abilities and all industries to compare notes and learn from one another. The odds are good that there’s a discussion that will benefit your own sales efforts, and it’s all free.